The latest refugee deaths in the Mediterranean—up to 700 people drowned when the overcrowded fishing vessel in which they were travelling from north Africa capsized of the coast of Libya—follows a similar tragedy last week in which 400 people perished. In October 2013, more than 360 people, mostly from Eritrea, lost their lives when their boat caught fire and sank off the coast of the Italian island of Lampedusa. In September 2014 more than 500 migrants were deliberately killed at sea. The attack allegedly occurred after the migrants refused to board a smaller boat in the open water and the traffickers reportedly laughed as they drowned, hacking at the hands of those who tried to cling to the wreckage. Witnesses report that as many as 100 children were on board. In the absence of official records, or bodies to count, it’s hard to say exactly how many people have died trying to cross the Mediterranean. The International Organisation for Migration (IOM) released a report in late September 2014 putting the number at 3,072, accounting for 75% of worldwide migrant deaths. But with so many lost at sea or along the way, the real figure could be far higher. If one listened to some media reports in recent days one could be forgiven for thinking that increased migration to Europe was the result of 'good weather' rather than increasing governmental instability and violence. The motivations and aspirations of migrants themselves are largely absent. Migrants are presented as victims, 'illegals' and objects of control. The 'solution' is technical, bureaucratic and framed as an issue of migration management. Little attempt is made to explain why thousands of men, women and children would risk their lives to get on an overcrowded boat to cross a dangerous sea or what their hopes and aspirations might be. Migrants’ lack of agency is reinforced by stories of agents, smugglers and traffickers who dupe them into making the journey to Europe. Migration looks very different when seen from the perspective of migrants themselves. Although 'migrants' are represented as a homogeneous group, there are significant differences in the motivations, experiences and aspirations of those who travel to Europe. For economic migrants, the decision to leave is generally a conscious choice by relatively well-off individuals and households to enhance their livelihoods. Most migrants are not the poorest of the poor. Clandestine travel costs anywhere from $5,000 to $35,000. Many of these migrants are petty entrepreneurs who sold their businesses or property to pay for the expensive trip. Migration routes into Europe. Author provided. But there are also growing numbers of migrants for whom the primary motivation for migration is the search for safety and protection. As noted by UNHCR, the international agency tasked with the protection of refugees, events unfolding in Syria, Iraq, the Central African Republic, South Sudan and elsewhere, combined with the deterioration of the situation in countries where refugees were residing, are forcing increasing number of people to move. At the same time European governments have funded the EU border agency, Frontex, to implement a series of policies that make entry to Europe more difficult. With few opportunities to enter Europe legally, thousands of people threatened by persecution and serious human-rights violations are pursuing increasingly convoluted and dangerous sea routes. 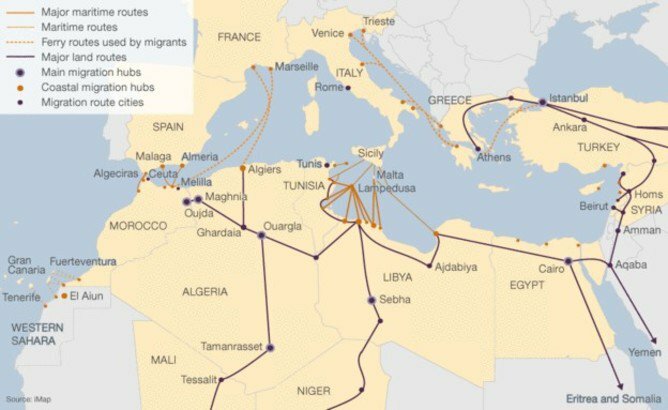 As the routes across the western Mediterranean have been blocked there has been a sharp spike in the numbers of people attempting to cross via the central Mediterranean route, often leaving through conflict-torn Libya where there are no effective border controls and smugglers operate with near impunity. These journeys are longer and the risks greater. My own research found that people are increasingly beholden to the decisions of traffickers and smugglers whose motivations are often far from altruistic. Most are aware of the risks before they travel but decide to continue because they feel they have no alternative. Volume of migrants. Author provided. The story of migration to Europe from the countries of north and west Africa has captured the public and political imagination since the late 1990s when Europe started to strengthen its external border controls. This story is dominated by images of small boats packed with refugees and migrants trying to reach the coasts of Europe, of young African men scaling fences—and of corpses washed up on to European beaches. In the context of rising public concern in many countries about increased migration, these images have been used to legitimise increased border controls. Not everyone dies trying to cross the Mediterranean. The lucky ones reach the islands of Lampedusa, Malta or Sicily or are picked up by the Italian navy or coastguard. Nearly 10,000 migrants have been rescued from boats travelling across the Mediterranean to Italy in the past week alone. Until recently these rescue efforts were undertaken through Mare Nostrum, a search and rescue mission established after the Lampedusa sinking in October 2013 and funded by the European Commission to the tune of around €30m. But the search-and-rescue effort has been scaled back significantly since November 2014 when Mare Nostrum was replaced by the 'Triton'scheme co-ordinated by Frontex. This scheme is confined to a 30-mile zone around Italy’s coastal waters, possesses far less maritime capability and is focused primarily on protecting borders and preventing illegal entry, as opposed to search and rescue. Amnesty International condemned the decision to end Mare Nostrum, saying it would “put the lives of thousands of migrants and refugees attempting to reach Europe at risk”. This does indeed appear to be the case. 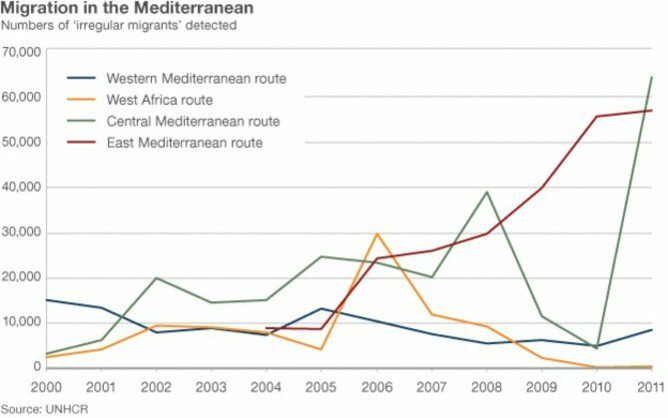 According to UNHCR the death rate has soared 50-fold since the scrapping of Mare Nostrum: there have been almost 900 deaths already this year compared to just 17 during the same period in 2014. The decision to end the search-and-rescue mission in the Mediterranean does not appear to have been just a financial one. The 2015 budget of Frontex has been increased by 16%, from €97m to €114m—and the largest share of the extra funding has been directed towards Joint Operations at Sea Borders. Rather it reflects the politics of migration policy in Europe, which has resulted in an overwhelming focus on border control and migration management as well as fundamentalar—arguably wilful—misunderstanding of the reasons why people make the crossing in the first place. The UK government has refused to support search-and-rescue operations to prevent migrants and refugees drowning in the Mediterranean, arguing that it will simply encourage others to make the journey. The government believes that rescuing those who are drowning creates an 'unintended pull factor' and that efforts should instead focus on preventing people from making the crossing. The expectation, it seems, is that the (future) fear of drowning will outweigh the (immediate) fear of violence and persecution. For many this is clearly not the case. The reports continue to flow in: as I write a further 40 people are feared drowned after an inflatable boat sank just off the Sicilian coast. When the decision to scrap Mare Nostrum was announced, the Italian navy said it would continue its search and rescue role—despite political pressures to do otherwise. It is time the rest of Europe stepped up.